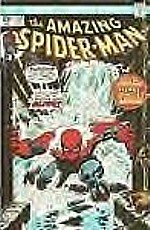 Essential Spiderman #7/reprinting Amazing Spider-Man #138-160, Annual #10 and Giant-size Spider-man #4-5/$16.99 & 560 pages, Marvel Comics/writers: Gerry Conway, Archie Goodwin, Len Wein; principal artists: Ross Andru, Sal Buscema, Gil Kane/sold at shop-front and on-line comics shops and on-line auctions. I was much younger when I last read an Amazing Spider-Man comic book. Reading the massive Essential: Spider-Man #7 which reprintsissues from the mid-1970s made three things apparent to this now more mature reader. The artists from this collection were exceptional. The art is reality-based and melodramatic. Men are more muscular and women are more beautiful than in this world. Even the drama of New York City skyscrapers is heightened through exaggeration. This is heroic literature dressed in circus costumes. Visually, it’s life lived BIG. The stories were well crafted, melodramatic, and formulaic. Melodrama is “a play full of suspense in a sensational and emotional style”, and after enduring a smattering of personal problems relatedto his job or his friends or family, Spidey always faces, and eventuallydefeats, a villain. That’s formula. Spider-Man’s adventures were not written for older adults. Peter Parker is a young man in these stories, but his personal problems wear only the sheen of reality. Life is actually more complicated and painful, filled with greater disappointments and fewer resolutions than in Spider-Man’s world. Our villains aren’t as easily recognized; they don’t wear costumes. But, then again, that is as it should be. Spider-Man exists so that we can escape the real world. And he does his job well.